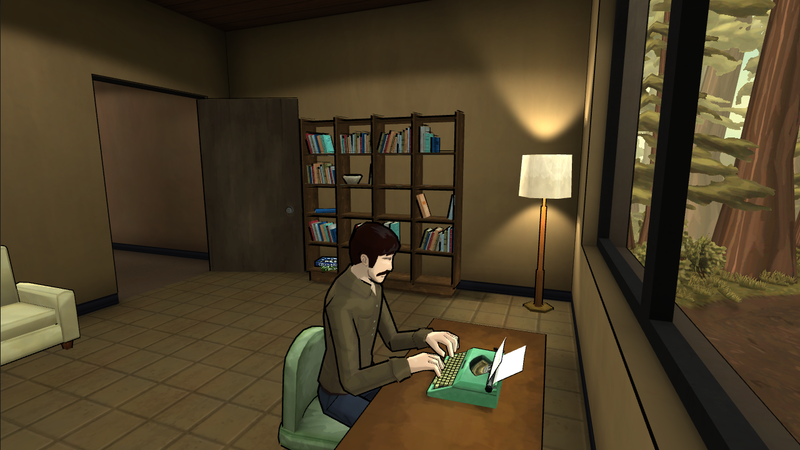 The Novelist, a game by Kent Hudson, is a game about choices, but more specifically, it is a game about the imperfection of our choices and their personal impact on those closest to us. 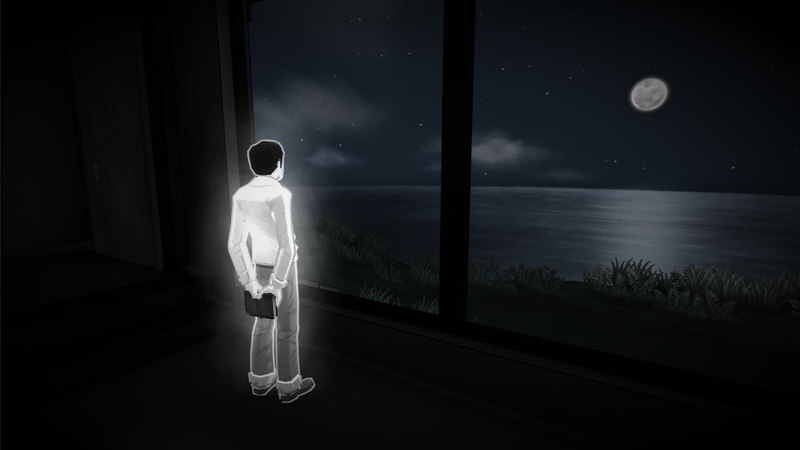 The game puts players in control of a ghostly presence in the summer vacation home of the Kaplan family: Dan, Linda and Tommy. Linda, the mother, gave up painting to stay at home with Tommy who has been struggling at school due to a potential learning disability. Dan is an aspiring writer trying to finish his second novel while juggling being a father and husband. Dan hopes that the time on vacation with his family will allow him to focus on finishing his book while Linda hopes that the time away will allow her and Dan to figure out the next steps of their rocky relationship. As the ghost of the Kaplan’s summer home, players can roam around the house and read the Kaplan’s letters and journals and sneak up behind each family member and explore their memories. There is a stealth mode where players must avoid being detected by the Kaplans and a story mode, where players are free to roam the house without worrying about startling its inhabitants. In the stealth mode, startling the Kaplans may limit the extent to which players can influence their affairs. The game is played in rounds and in each round the player must decide which family member’s desire to fulfill. By possessing various objects, players can influence the family to make decisions that please the different members of the family. Choose to influence the family to go camping per Linda’s request and Dan’s work on his book will suffer and Tommy will be disappointed his parents didn’t take him to the amusement park. There are, however, ways to make compromises in each round that will please one of the members of the family. Thus, each round, if players thoroughly explore the house and the Kaplan’s memories, players will be able to please two of the three Kaplans. It doesn’t take long to discover how to navigate the house without being detected by the Kaplans and finding all their notes and memories is not particularly difficult. Early on, I understood that each round would basically give me the same options—influence the family to do something that will please Dan, Linda or Tommy and then find the compromise that will please another. I was certain that this would get boring quickly, but I was surprised to discover that this dynamic actually grew more interesting as decisions built on one another and past actions began to weigh in on present decisions. Early on, I was determined to make sure Dan did a great job on his book—writing was his dream. after all. and I related to Dan, as I recently left a job I loved to pursue a dream of my own. But the more I pushed Dan to prioritize his novel, the more difficult his relationship with Linda became and the more Tommy grew to resent him. Soon Dan was faced with a dilemma—write a great novel or be a good husband and father. We would all like to think that we don’t have to make these sorts of choices in life, that there’s always some way to have it all. We like to think we can pursue our dreams and still be great spouses and parents. In my short time as husband and father, however, I can attest to having experienced all the tensions that Dan faces. In fact there is rarely a day that goes by that I don’t feel them. I wanted Dan to be able to do it all—to be a great husband, father and writer because I want to be able to do it all. Most of the time videogames let me do just that. The Novelist, however, offers a far more valuable experience than the average power fantasy. It gives us choices that hurt and, as a result, choices that matter. The Novelist is not without its flaws. The voice acting, while sincere, feels a little flat at times, and I doubt many players will find stealth mode particularly challenging. But The Novelist reminded me that while I sometimes play videogames to escape reality, the most meaningful game experiences I’ve had confront me with reality in a meaningful way. The Novelist does this by reminding me what I’ve neglected every time I make a decision. The result is a surprisingly powerful game that asks us to consider what we prioritize in the tension between our dreams and our families.